i-Cybie robotic dog from SilverLit / Tiger Electronics is a great companion for children ages 8 and up. Originally put on the market by Hong-Kong owned Silverlit Toys USA. I-Cybie was the "talk of the show" at the US Toy Show in 2000.
i-Cybie Version 2, released in July/August 2005, has even more features, smoother motion, better performance and longer batterly life, now coming standard with a NiMh long life rechargeable battery (version one only had had a NiCad battery). The remote requires two AAA batteries (also included). He has several functions including: COME HERE, ROLL OVER, STEP BACKWARDS, BODY SHAKE, SPEAK, LIE DOWN, DANCE, SHAKE HAND, SIT, WAVE, GREET. He can even do a HEAD STAND!! Using advanced artificial intelligence, each Cybie develops its own unique personality over time. i-Cybie robotic dog has 16 motors and is powered by a 9.6 volt rechargeable battery. Three LR44 button cell batteries power his backup memory and the headset uses two AAA batteries. I-Cybie comes with a remote control and a battery charger. He can detect obstacles, monitor his own power level, recognize your voice, get up if he falls over and communicate with other I-Cybies and Super Poo-Chi and Poo-Chi. iCybies eyes even change colors depending on his interest and activity level. I-Cybie robotic dog also recognizes edges, allowing him to stop before walking off the edge of a table or falling down some stairs. he even senses light and the touch of your hand. Walls and other obstacles are also detected. Current units are even being designed for future expandability (even more features). Note: Tiger Electronics also markets Poo-Chi a low end unit that does not walk. Super Poo-Chi is a few inches taller, has voice command, more touch sensitivity and greater mobility. 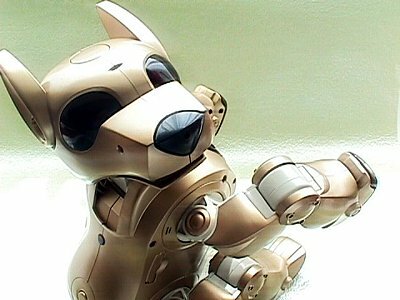 Now (2005) I-Cybie is selling very strong again and remains one the most advanced robotic dogs available anywhere. Plus his Quick Start Card is online giving you a good idea of how easy I-Cybie is to setup and control, along with the full instruction manual. The many features and relatively low cost of I-Cybie are even attracting robotic experimenters, student projects, and other technical applications. I-Cybie rules!!. This close up show some details of I-Cybie construction.